In spite of a global campaign asking Western governments to act in Darfur, more than a decade ago, the crisis in this region in Sudan is still ongoing. The violence never ended. The Sudanese regime is held responsible for a genocidal military campaign against its own civilians - and yet, it continues to stay in power. How is that possible? See for yourself in this documentary: investigate the crisis, look at interviews with key players or follow the clues. Make up your mind: Did Evil Win? The core of the project is the web documentary Did Evil Win? An interactive website designed as an obsession wall. The documentary consists of eight in depth interviews, edit in more than 300 short video clips. Users can explore the material by following the storylines of the interviewees or searching by theme. More than a decade ago, millions of Europeans and Americans took to the streets to join a score of celebrities in the campaign to ‘Save Darfur’. Violence had broken out in this region in Sudan in 2003, when African opposition forces rebelled against the government in Khartoum, which was dominated by an Arab class. The Darfur opposition forces demanded equal treatment, rights and distribution of wealth. The regime’s response to this uprising was brutal, as it sent in the Janjaweed militia to strike it down. These ‘devils on horseback’ were given carte blanche in the military campaign and many civilians fell victim to their actions: they killed men, raped women and girls and set fire to villages. The Sudanese government bombed the region. As a result, hundreds of thousands of people died, millions more fled their homes and ended up in internal discplacement camps. American student unions joined forces with Hollywood celebrities like George Clooney, Mia Farrow and Angelina Jolie to launch a campaign for Darfur’s citizens. Soon enough the sentiment also reached European audiences and the campaign grew: activists paid millions of dollars for print ads, events and protests to pressure national governments to act. In 2007 the United Nations and the African Union sent peacekeepers to Darfur in order to protect the civilians. But with China and Rusland vetoing the resolution procedure, the International troops only had a limited mandate. In 2009 the International Criminal Court issued a warrant of arrest for the Sudanese president Omar al Bashir for charges of war crimes and crimes against humanity, adding the count of genocide to the warrant one year later. Apparently unimpressed, Bashir ordered the expulsion of international aid organizations from Darfur and forbade journalists from entering the region. To this day, reporters must be smuggled in to reach the Darfuri people. In spite of the global campaign, the attention for Darfur quickly faded. While international politicians bickered about mandates, the Sudanese government was successful in its policies to divide and rule over the Darfur opposition. Millions of people continued to live in refugees camps. Even now, civilians are killed and raped every day. Villages are burned. Nothing has changed in Darfur. What has changed, however, is the West’s position towards the Sudanese government. While the European Union recently struck a deal with the regime to contain the refugees within its own camps, Washington has lifted the very sanctions it once imposed on the country. How is it possible that in spite of the protests, political pressure and even international warrants of arrest, Omar Al Bashir’s government is still in power in Sudan? 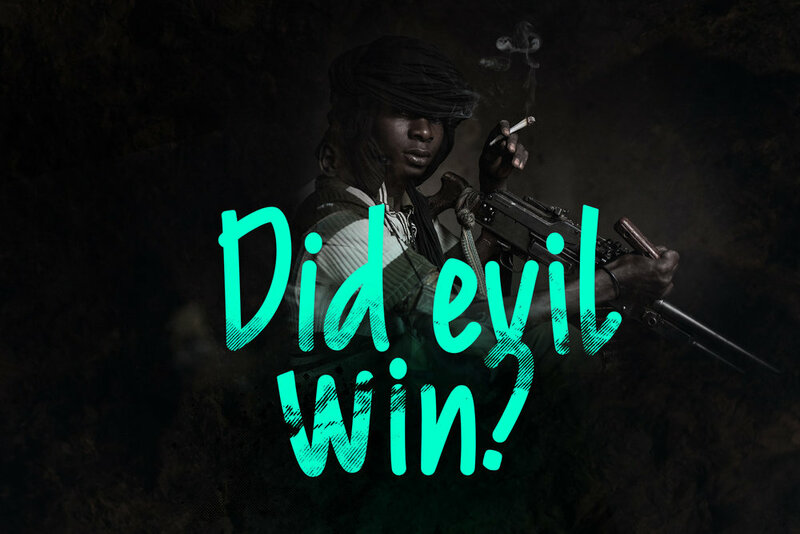 We interviewed the key players who were involved in the global advocacy campaign and asked them: Did evil ultimately win in Darfur? The (award) winning photo's of Adriane Ohanesian were exhibited in the Netherlands together with the documentary. The exhibition was on display in the Compagnietheater in Amsterdam. The Did Evil Win? documentary was presented inside a Tukul, a Sudanese traditional home. The Tukul was built by Sudanese diaspora in The Netherlands. Klaas van Dijken during the opening night for the Did Evil Win? exhibition in Amsterdam. The photography exhibition of Did Evil Win? in Compagnietheater Amsterdam. Heeft het kwaad gewonnen in Darfur? Heeft het Soedanese regime in Darfur gewonnen?